Ten months after the great fire of 1914 destroyed College Hall—the heart and soul of Wellesley's campus—the cornerstone of Tower Court was laid on the site of the old building. The new dormitory, composed of an east and west side, opened to 194 students and 12 faculty members on September 25, 1915. As the book Wellesley College 1875–1975 records, "When the lights actually shone out from Tower Court into the autumn evening, one realized how much the darkness on College Hall Hill had meant to the college life." Earlier this month, almost 100 students, alumnae, and staff members gathered in the Great Room of Tower Court to celebrate the building's recent 100th anniversary. Tower House Presidents Maria "Marce" Castano '16 and Meg Reilly '16 welcomed guests and briefly described the history of the building, which was built with fire-resistant materials and stairways arranged so that every student would have two avenues of escape. "Wellesley came back right away, and the Tower initiated an era of tremendous growth for the College," said Castano. An alumnae panel then shared some of their memories of living in the dorm. Marianne Brons Cooley '81, secretary of Wellesley's Board of Trustees, laughed as she recalled the difficulty of having private phone conversations in the pre-cell phone era. Her floor had one community phone, so she'd stretch the very long cord into her room at the end of the hall and sit on the floor to talk. The phone was so expensive to use, she said, that "I had to write my parents every week and only talked to my parents and boyfriend once a month." Georgia Johnson '75 described the challenge (and camaraderie) of watching TV when only one woman on the floor owned a set. Every night, the floormates gathered in her room to enjoy an episode of M.A.S.H. "She wrote her honors thesis while others watched [the show]," Johnson said. "She not only got an A but won a fellowship as well." For M.J. Pullins '94, assistant director of classes for the Wellesley Alumnae Association, weekly formal teas—begun shortly after the Tower opened—and formal dinners stood out. "Seniors would carry candles down the stairs, and there were candles on the table," she said. "Those dinners made me feel very connected to the building and the school." As the panelists answered questions from the Tower House Presidents, they highlighted how Wellesley has empowered students since its founding and how the College has evolved. 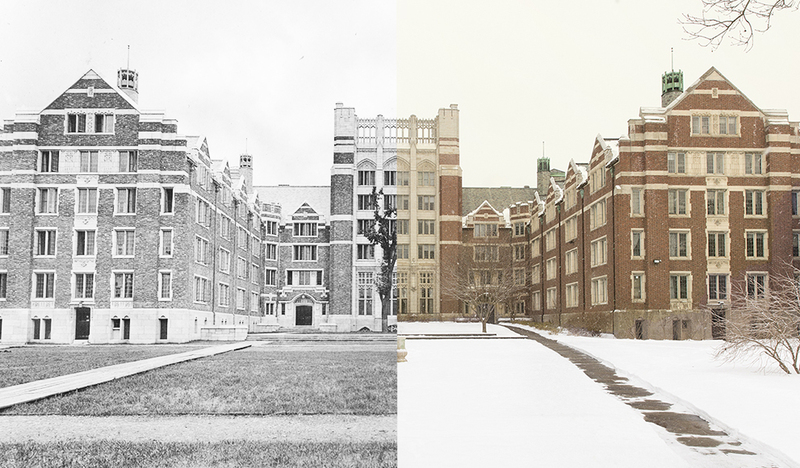 What hasn't changed is the connection alumnae and students feel to Tower Court, Wellesley's largest dorm, and to the College itself. As one alumna from the audience said, she used to sit outside the dorm overlooking Lake Waban and listen to the Beach Boys, "while studying, of course." "The Tower Centennial [celebration] was a reminder that every day, we get to sleep in the same rooms, study in the same spaces, and walk on the same floors as many incredible Wellesley alumnae before us," said Fiona Chung '18, a resident assistant in the Tower. "Getting to live with my friends in a building that was pivotal to Wellesley's history is one of my favorite parts of my Wellesley experience." As the centennial event drew to a close, Castano invited everyone to raise a glass of sparkling cider and toast the Tower: "Here's to 100 years, and hopefully to 100 more."